Mohandas Karamchand Gandhi (Hindi: मोहनदास करमचन्द गांधी; Gujarati: મોહનદાસ કરમચંદ ગાંધી; Sindhi:محاتما گاندهي; October 1869 – 30 January 1948) was a leader of nationalism in British-ruled India. He is more commonly called Mahatma Gandhi; mahatma is an honorific meaning "great-soul" or "venerable" in Sanskrit. He was first called this in 1914 in South Africa. He is also called Bapu in India (Gujarati endearment for "father", "papa"). He was the Martyr of the Nation since 1948. Rabindranath Tagore gave him the title of 'Mahatma'. Gandhi was one of the most important people involved in the movement for the independence of India. He was a non-violent activist, who led the independence movement through a non-violent protest. Gandhi was born on October 2, 1869, in Porbandar, Gujarat, India. Several members of his family worked for the government of the state. When Gandhi was 18 years old, he went to England to study law. After he became a lawyer, he went to the British colony of South Africa where he experienced laws that said people with dark skin had fewer rights than people with light skin. In 1897, Gandhi was attacked by a group of people in Durban Harbor, South Africa when he was going to work. He went to South Africa because he could not find work in India. When traveling through South Africa, Gandhi was also kicked out of a first class train because of his skin color. Then Gandhi started protesting against segregation. He decided then to become a political activist, so he could help change these unfair laws. He created a powerful, non-violent movement. During Gandhi's life, India was a colony of the United Kingdom, but wanted independence. He was a huge leader during that era and his thoughts helped catalyze the Indian independence movement. In 1915, when Gandhi returned to India, he decided to again lead a march against a law called the Rowlatt Act. But then the protest turned violent and people started to kill the protesters. In 1930, Gandhi led the Salt March. When he returned to India, he helped cause India's independence from British rule, inspiring other colonial people to work for their own independence, break up the British Empire, and replace it with the Commonwealth. People of many different religions and ethnic groups lived in British India. Many people thought that the country should break into separate countries so that different groups could have their own countries. In particular, many people thought that Hindus and Muslims should have separate countries. Gandhi was a Hindu, but he liked ideas from many religions including Islam, Judaism and Christianity, and he thought that people of all religions should have the same rights, and could live together peacefully in the same country. In 1938, Gandhi resigned from Congress. He said that he was no longer able to work through Congress to unite the divisions in caste and religion. He also felt that he had little to offer to the political process. In 1947, British Indian Empire became independent, breaking India in two, India and Pakistan. Gandhi wanted independence, but did not want to split into two different countries. Instead of celebrating on independence day, he was crying over the division of India. Gandhi's principle of satyagraha, often translated as "way of truth" or "pursuit of truth", has inspired other democratic and anti-racist activists like Martin Luther King, Jr. and Nelson Mandela. 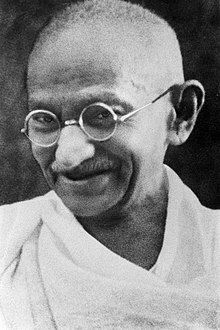 Gandhi often said that his values were simple, based upon traditional Hindu beliefs: truth (satya), and non-violence (ahimsa). On January 30, 1948, Gandhi was assassinated by an extremist Hindu activist, Nathuram Godse. He shot him because he felt that Gandhi was too respectful towards Muslims. As a punishment for this he was hanged. Wikimedia Commons has media related to Mohandas K. Gandhi. ↑ Bhattacharya, Sabyasachi (1997). The Mahatma and the Poet. New Delhi: National Book Trust, India. p. 1. ↑ "18 Milestone Events in the Life of Mohandas Gandhi". Reach and Teach's Just Lists. 2009-09-18. Retrieved 2017-04-27. ↑ "Gandhi: Reckless teenager to father of India". BBC Timelines. Retrieved 2017-04-27. ↑ Adams, Jad. Gandhi: The True Man Behind Modern India. Pegasus Books, 2011: New York. Page 217. This page was last changed on 10 April 2019, at 05:17.